Kevin Mwachiro, author of „Invisible – Stories from Kenya's Queer Community“ talks in a video-interview with Caroline Ausserer about the making of the book, the situation in Kenya and his vision for a queer future in his country. Caroline Ausserer: What was your motivation for this book? Kevin Mwachiro: It started when we had just organized the OUT Film Festival at the Goethe Institute in Nairobi in 2012 with the then Director Johannes Hossfeld. We where overwhelmed by the number of people who showed up for the festival. So we thought if we could pull this off, let's see what else we can pull off. So that is the genesis of the book. How is the situation for queer people in Kenya? It all depends on where you live. People know homosexuality exists, but the overriding sentiment is that people would appreciate that it is not enwrapped in their faces. There is a lot of social stigma that people still need to overcome. But with Binyavanga Wainaina, a Kenyan writer who came out and other gay personalities who have been in the media, people are been shown a different face to sexuality. Mostly in outer areas, that is the country side, people are talking about it. We do not have that many spaces that we can claim as ours yet, there is still intimidation, blackmail, people still get harassed, but that is not the norm. I cannot see whether there is a higher level of acceptance, but in general you are able to live your life the way you want. If you are discreet, you can comfortably live your life. How is the legal situation in Kenya? How is it in comparison to other countries like Nigeria or Uganda, where it is getting worse? We still have the penal code that outlaws acts against the order of nature, that is an issue that people are debating about, but I am no legal expert. We can say: being gay is not illegal in Kenya, it says that homosexual acts are deemed as illegal. How is the LGBTI community in Kenya reacting to the recent developments in other African countries, like Nigeria and Uganda? There is a lot of contact with the other members of the movement across the continent in Uganda and Nigeria. There have been recently demonstrations to show solidarity in front of the Embassies of Uganda and Nigeria here and the community is keeping itself informed about the developments and offer moral support. Why do you prefer the term „queer“ over LSBTI in your book? Being a conservative country, I thought people would not be able to walk with a book in public if it had the word „gay“ on it. It is also not only about gay people, it is also about bisexual, transgender, intersex people. I was imagining a situation where a normal street vendor should be able to have this book on his table. People still have prejudices around the word „gay“. If “Invisible” had that word in the title, I do not think it would have been well received. Also the word „queer“ is not uncontroversial, in some culture it is seen as a political incorrect word. We are just starting in claiming ownership of this word and getting acceptance. It has caused some controversy, some people think it is offensive. But it is there to open up discussions and just make it easier for people to read. I suppose you chose this word also to give room to the variety of people with different gender identities or sexual orientations. So why the title „Invisible“? Because to some people we are invisible. Some people chose to make gay folk invisible. Sometimes you do feel invisible. It is neither only positive nor negative. By being invisible you can live your life the way you want without anyone interfering in your life. But the fact that society chooses to make us, the LGBTI community, invisible by sometimes refusing to acknowledge the existence of queer people, I chose the title „Invisible“. It has been interesting, it has been a lot more positive locally than imagined. The magnitude of the stories in the book hits me, because these are Kenyan stories. You cannot say homosexuality does not exist in Kenya anymore. This narrative is changing. These are Kenyan stories. I got an interesting message this morning of a friend who told me of a boy who had to struggle and came across a copy of this book. He came out saying this is what I am struggling with and I thought I was alone. It is hard hearing people say they are alone – even if there is the internet and so much information about sexuality. But when you do not have people to talk to and you don't have stories that relate to your surroundings, it can actually be very lonely. When you hear stories like that it excites me, it validates the work I have done. I received overwhelming messages of support from my friends and some sections of my family saying what I have done was very brave. How did you get to the authors of this book? It was just a question of writing up a long list of people, some friends, some acquaintances. But then I thought this is not doing justice to the gay community, so I went around asking people. Having won over their confidence, they agreed to be part of the book and so I collected the stories for the book. Those who did agree on it eventually got published. These are all very brave stories, very intimate, hurting. When I read the book I felt as if there was so much suffering, but also a sense of liberation by being able to live the own life. Do you see a common issue or common theme in your book? You put it beautifully. There is an element of that, there is that rocky questioning part, where you feel you're alone, you're confused about your sexuality, you want to fix your sexuality, where you want to do the right thing. This is prior to accepting yourself for who you are. There are many who want just to do the right thing in the eyes of society. When I look back, there is this common thread, but in the end of the day there is self-acceptance which is important for people who are struggling with their own sexuality or matters of gender. It's just to say: it is ok. We all have our own genesis, and you will eventually get to a place where you are comfortable with yourself. All those people whom I interviewed have come along that journey. What should change in Kenya in order to ease the life of queer people? I wished that more people came out to claim that space, that they'd say 'we are Kenyans and we are gay'. One thing would be this: if more people would become more visible. Second change regards society: it needs to change in a way to offer a favorable environment for LGBTI people. And, third thing, the law has to change too. With more visibility, also the „myth“ that homosexuality is not considered African would be refuted. I think the book challenges that myth. I hope that the book helps to bestow that. What is your vision of a queer future in Kenya? My crystal ball? My vision is of a queer Kenya that has universal elements, but one that defines itself within the African space. There are many “DNAs” of being African. Having a more Western-leaning background, I tend to think more that way. But there are people who may not define themselves as being gay, at least not in the Western perception of being gay. I hope it becomes a place, where an African gay identity is established for itself and is comfortable by itself and contributes to the wider global gay identity. I hope this makes sense. Long time ago I heard from a couple, both elderly fishermen, who were in a relationship, but both had wives separately. Maybe if things were different, they would not have chosen that, but it is not to me to judge. They spent a lot of time together... It is difficult if people want children or if they want to keep an element of their faith. Some people might find it difficult to reconcile (eg. religion and homosexuality). There should be space to discover and to come to terms that African or Kenyan sexuality can be as organic in the way that suits its best. I learnt a lot from the struggles in the book and admire your authors and want to thank you for it and this interview! Born in 1973, Kevin Mwachiro has lived and worked in Nairobi for most of his life. After attending the city's Daystar University, he later went on to study at Bournemouth University in the United Kingdom, where he attained an MA in Radio Production. 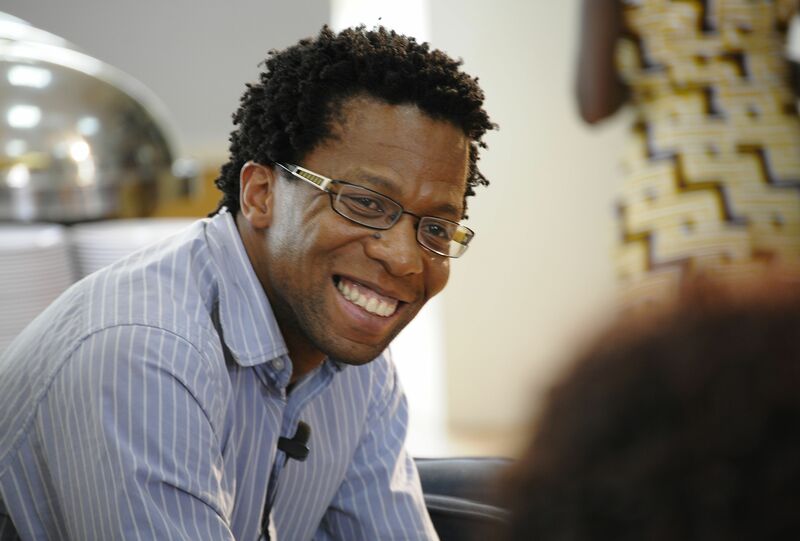 He has worked as a radio journalist and producer in Kenya, Uganda and the UK and as a correspondent for the BBC World Service. He is currently working as communication officer at the international development organisation Hivos in Nairobi.